Home / Recreation / Games / Have You Chosen the Correct Path? If you haven’t figured it out, we play a LOT of board games. For a retail price less than treating the four of us to a movie, a board game provides hours of entertainment and quality family time. 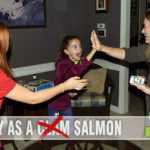 We introduce our girls to complex strategy titles to help their young minds grow, but aren’t above playing something that will make everyone laugh and squirm. Many times I need to pour over new game instructions for a long time before trying to demonstrate it to the rest of the family. 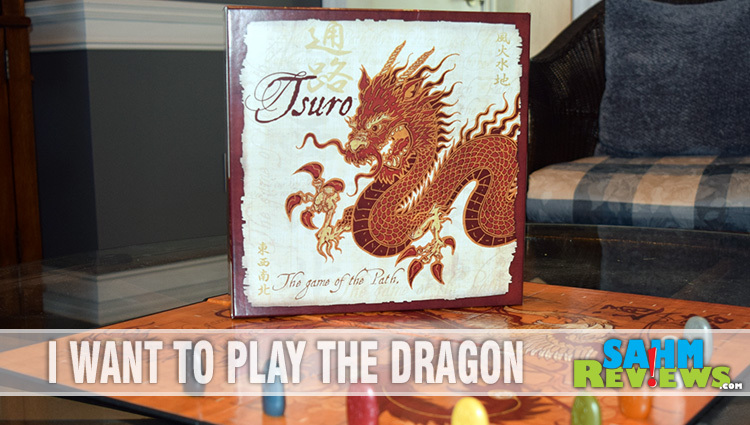 With Tsuro, an award-winning title from Calliope Games, this fortunately wasn’t the case. Subtitled as “The Game of the Path”, this accurately described almost everything that happens in the game. 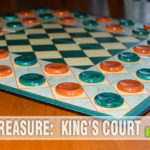 Underneath the beautiful theme is a basic tile-laying game in which you are simply trying to outlast the other players by not falling off the edge of the board or crashing into another player. This basic premise is what would allow children younger than the advertised minimum age of eight to enjoy it. Each player is dealt a hand of three tiles at the beginning of the game. These tiles have paths on them that move in various directions. Everyone also chooses their starting location on the board. This can be on any side and in any square along one of the beginning path markers. On your turn you simply lay a tile next to the tile you are currently on (on the side your piece is on) and move your pawn along the newly-extended path. Then draw another card – that’s it! But after a couple rounds things start to get a little hairy. When you lay a tile, if there is also another piece this new path affects, you also move that player’s pawn to the end of their path. 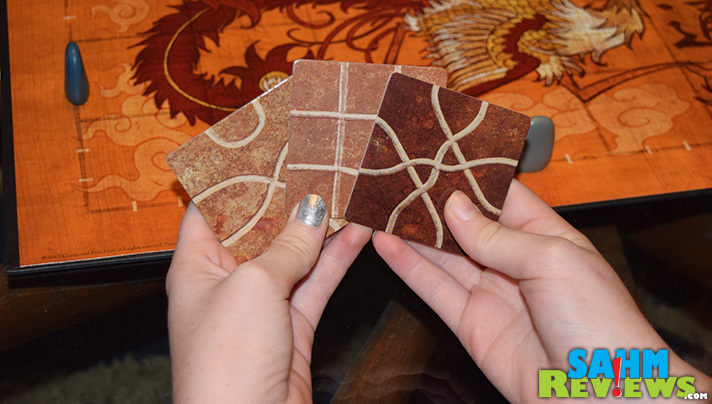 Because you’re limited to only three cards (and fewer once the draw pile runs out), you are forced to plan ahead a couple turns to make sure your tiles don’t lead you off the edge of the board! And I need to mention something about these pawns. These are not your typical cut-from-wood meeples you see in so many other current games. 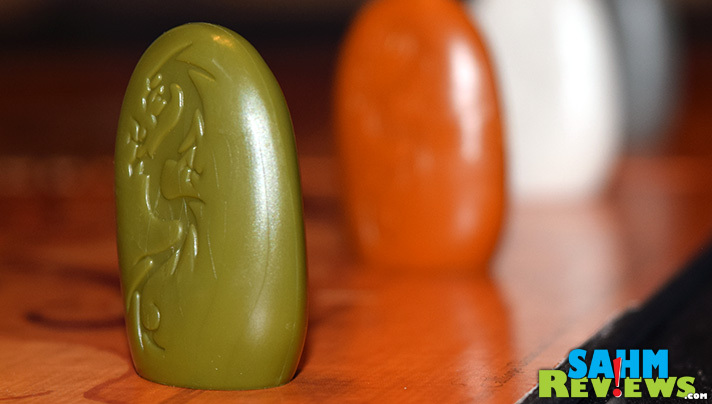 These are molded plastic markers with the same dragon recessed into each one that you see on the front of the box. Meant to mimic ivory, they are a joy to use. As the board starts to get filled up, you will be limited to what you can play by the one or two tiles left in your hand. At this point you are just trying to stay alive longer than your opponent! 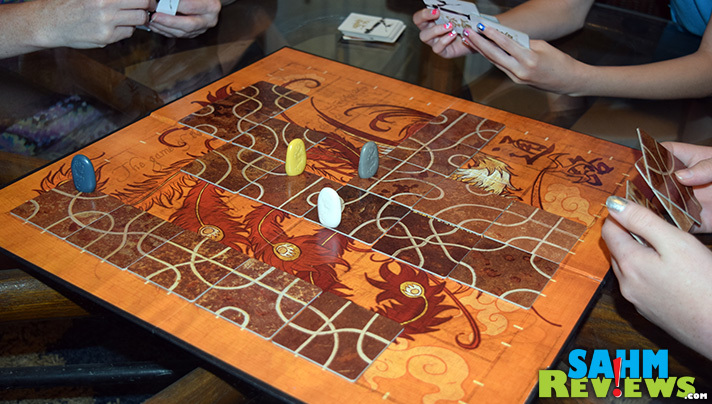 Tsuro supports up to eight people, making for a very different and chaotic game when a full compliment of players are present. Your paths begin to cross (and meet) much sooner in the game, bringing another element to the rules. When a player is eliminated, the cards in their hand are returned to the draw pile – so they do end up back in play. In addition, if you were the one responsible for eliminating someone else, you can swap tiles in your hand with theirs before they are returned. If you are good at planning your moves, this can be a huge advantage. But eventually all (or nearly all) of the tiles will be played and only one person left standing. Tsuro rounds only last about 15 minutes, so getting a couple in to prove it wasn’t just luck the first time is always an option. 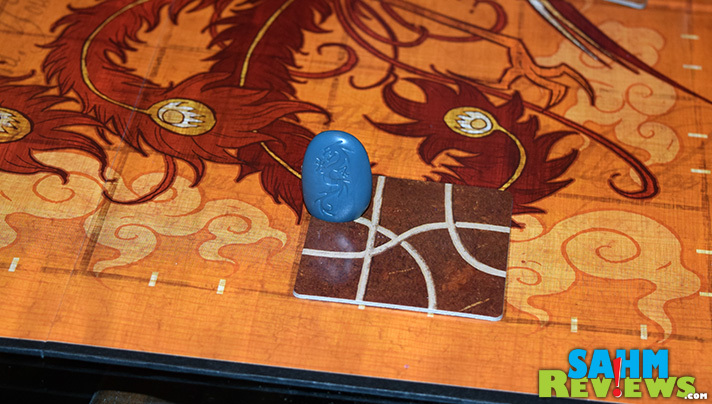 Tsuro is one of those game that has been so well-received by the gaming community it has already spilled over into mass-market retail. You can only attribute this to the ease of learning and quality manufacturing in a package that runs around $25. Not only can you find copies on Amazon and direct from Calliope, your local Barnes & Noble and other big-box retailers carry Tsuro as well. 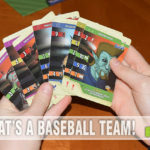 Remember last month how we gave away a copy of Double Double Dominoes thanks to the generosity of Calliope Games? 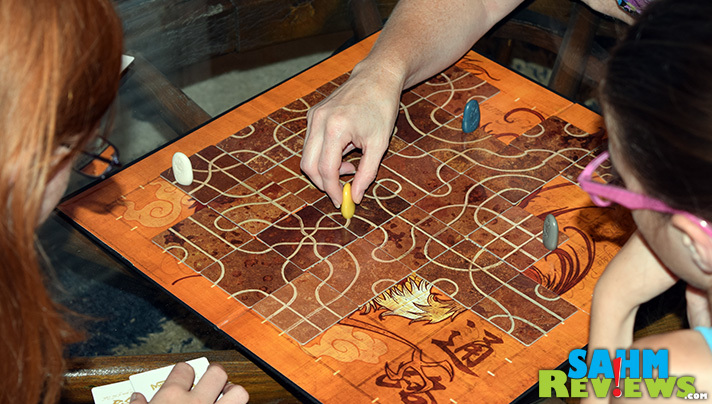 They’re at it again and are going to award a copy of Tsuro to one lucky SahmReviews reader! Enter using the form below and don’t forget to check back each day for additional entry options! Before you know it, you’ll be on the right path! I love Tsuro soooooo much! Tsuro is such amazing game! Seems like a fun game! I would love to play this game wit my niece! This sounds easy enough to play–but then those paths start to intermingle–and the cards start getting used up–and uh oh—I would definitely like to attempt to play it anyway!! This is a very interesting looking game. I might have to get it to play with my husband (kids are too little). I like the strategy required for this one. Like this game and other similar abstracts games. I love how detailed the pawns are with the dragons embossed unto them. It’s rare to see this type of quality in many of the board games on the market today. That sounds like a fun game. My youngest would love it because it looks like a big maze. That looks like a total blast, and there’s something about those game pieces which draws me in all the more! Always looking for a new family game. This one looks fun! Looks like a really fun game! My kids would love it.! Heard of this, I don’t think I have anything like it in my library. My favorite style of game is worker placement. Stone Age is a classic. 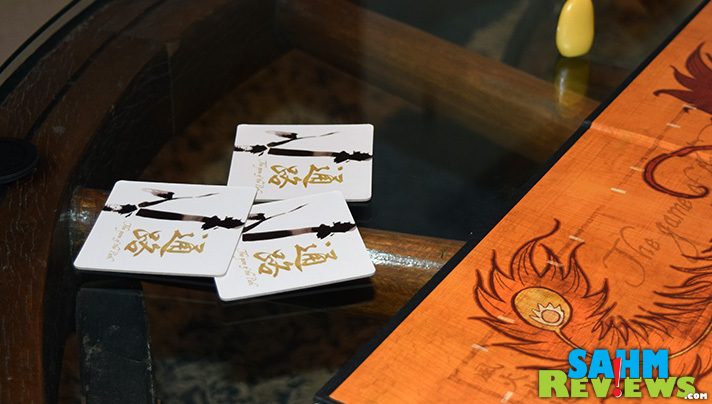 My newest favorite is Rokoko, which relies heavily on resources management and worker placement, but also adds a small component of deck building. Sweet! Thanks for the giveaway! I would love to win this! One of my favorite games!! Woo, giveaways! I’ve been wanting to play this one for a while! Simple, the way it should be. My 6 year old loves this game!! I love Pay Day or Monopoly for board games. This looks awesome. My bf and I are so into board games. 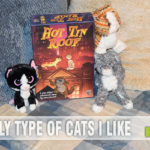 I/we enjoy board games that are not repetitive and that allow for freedom of turn taking (not something like pick the top card and do exactly what it says). Games that take thought and possibly skill, not just luck or games that can be played by robots because there is no free choices involved. 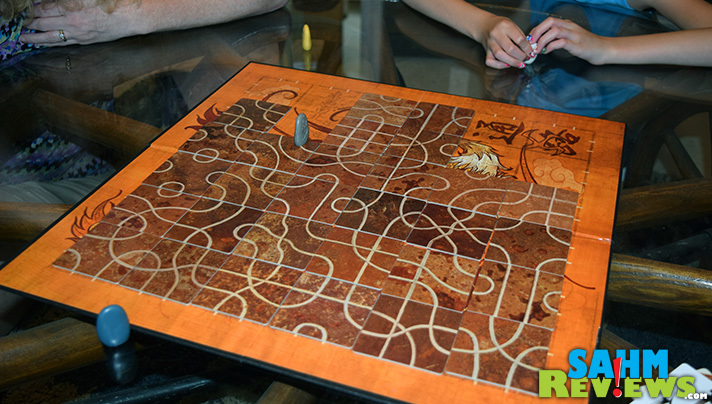 Tsuro looks great! Tsuro is a really good game. Anyone can play it! I am a fan of Tsuro. I need to get a copy of it and get my girls playing it. I think I would like the ship version better as there is a bit more going on.